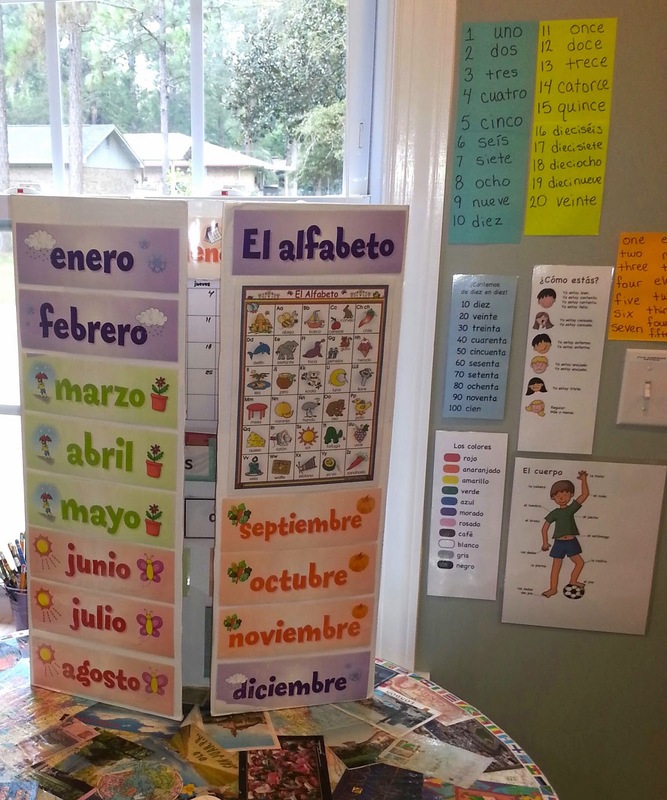 I am very excited to offer a review of Calico Elementary Spanish Level I, which I have been using with my kiddos for a couple of months. 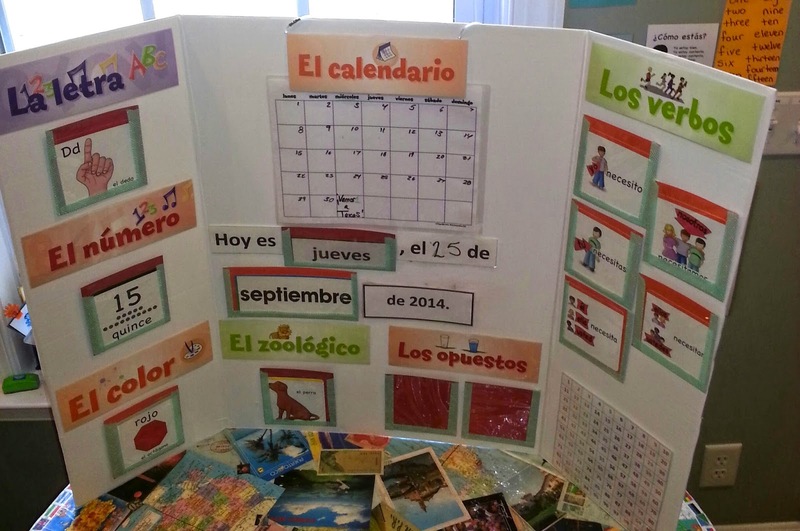 Calico's Elementary Spanish program is an immersion curriculum, and is designed to be used by instructors who speak Spanish comfortably. ** It consists of two levels. Level I targets grades K-5, level II grades 2-6. Calico offers 3 separate pricing structures for this program, depending on use--schools, homeschool groups, and individual homeschool families. Contact info@calico.com for pricing details. The Teacher's Manual contains 15 chapters and a small introductory lesson. Each chapter has an optional 5 day/60 minute and 10 day/30 minute schedule. Lessons for each chapter include songs, games, calendar, numbers, the alphabet, verbs, colors, and animals. An optional script is given for each activity--no long prep time needed! Click here for a free sample lesson. In our homeschool, I use the 5-day schedule. My kiddos already know much of the number, alphabet, colors, shapes, and animal vocabulary, so I use those portions of the curriculum as a quick review. I spend most of our time focusing on conversation, comprehension, the verb activities, songs and games. I take full advantage of all the dialogue samples given in the teacher's guide. The sample dialogue gives so many ideas for conversation that I would not have come up with on my own. I love that verb conjugation is (gently) introduced right away in chapter 3. Often times elementary Spanish programs focus solely on vocabulary and ignore actually trying to form sentences and learn basic grammar. Students begin by learning the difference between I need and you need. The next chapter teaches we need and s/he needs. By the end of Chapter 15, they will have completely conjugated necesitar, and also learned conjugations for poder and querer. My kids love the songs from the Mi guitarrí music CD. We have tried other Spanish programs with music in the past, but my boys disliked the songs so much that they refused to listen to them. I find them walking around the house singing the songs from Mi guitarrí and putting on the CD when we're not even doing school. The songs from the disc are also available as videos online through Calico's Youtube channel. My boys also very much enjoy watching the videos online. The Calico flashcards are really well-done, colorful, easy to read, and sized appropriately. The bulletin board set is also visually appealing and appropriate for elementary-aged kids. The bulletin board headings and months of the year have sticker backs. I chose to laminate them instead of using the stickers to be able to move them around if necessary. The pictures below show how I have my Calico bulletin board set up. I bought a tri-fold display board from the Dollar Store and covered it with white contact paper. Then I created little pockets for the flashcards using old file folders and clear plastic from the pouches curtains and sheets are packaged in. I created a few of the items on the bulletin board, such as the "Hoy es (día), el (fecha) de (mes) de 2014. I printed the colorful hundreds chart from the web (sorry, I can't remember which site). Click here for a printable of the days of the week. Overall I highly recommend Calico Spanish. At first the price can seem very expensive, but with the quality of the materials and instruction, plus everything that is included with the program, I feel it is well worth the investment.